Ken's Exotics is a USDA licensed facility! Remember: No animal will be held for any customer without a deposit placed. The hold does not go into place until cash is in hand (must clear bank) . ALL PAYMENT MUST BE MADE 10 DAYS BEFORE DELIVERY (this gets me time to pay all facilities, airlines etc. before shipping and ensures that funds are in hand so I can set up health cert. and flights). When animals are ready to be delivered, if payment is delayed time and time again... the sale will be denied and your deposit will be forfeit. The animals will then be offered for sale again on the market. I feel that I need to state this, please be ready to pay in full when the shipment is ready. I have no problem with holding an animal for a specified time, sometimes at an additional fee... but this needs to be agreed to and worked out before the last minute if at all possible. Holding Deposit: Deposits are non refundable, these insure that customers show up to pick up their animals or not change their minds. I've paid people to wait for customers that never show up, hence why some funds must be paid upfront to ensure that my time is not wasted waiting for a "no show". In the rare case that something happens to the animal such as import permits falling through, death of animal or funds for another deposit were received before yours, the deposit would be refunded (obviously this applies only before animals are in customers hands)… but only in these specified cases. Any animals that die or are injured before delivered may be replaced instead of refunded, the option is up to me and/or my supplier to make. An invoice will be emailed or faxed to each client after the receipt of the deposit or any payment stating that payment has been received. No persons will be allowed to put funds down on any Tiger, Lion, or big cat until I have physical proof of a USDA license for the facility which the animal is being sold to. Animals are not held until a deposit is received. If any persons are involved in the transport of any big cat, they also will be required to show proof of their USDA license before the animals holding facility will release said animals to any persons. NO EXCEPTIONS! Waiting List Deposits: $500, this puts you in for the first available animal specified. Please note, this can be a long process with waits up to a year on some species, or longer. If the wait is longer than a year (unless otherwise specified on invoice) or if the animals become not available I will open talks with you to refund the holding deposit in full, as is only fair. Please see the About Us page for more info on our payment policy. If you have any questions just shoot me an email or call me. I offer references for your protection, I will not be offended if you ask for some. Imports: When you order an animal that is being imported, keep in mind that most imports take 30-60 days to come in (some species will take longer due to requirements), but sometimes there will be delays such as airlines not shipping due to weather or CITES putting temporary hold on a shipment while they clear up any problems with papers, etc. Any delays that happen are considered part of the process, although they usually are not the norm. If you experience delays you are still responsible for taking owner ship of the shipment, once you pay on these animals you must take delivery of them. If a shipment is ever denied for what ever reason, and returned to the point of origin I would refund all parties involved (rare, but I still need to state this) or replace the shipment (the choice is mine). Under the off chance that something happens to an animal while waiting to be delivered, I have the option to replace it or refund it at my discretion. Once the animal is in your hands, no warranties are given. Do you warranty the animals? No, I do not offer a warranty on any animals.I do not make any guarantee's or warranty of any kind due onto the nature of the hobby. Exotic animals require a different level of care than a typical puppy or cat, I will not put my neck on the line for someone's mistake. Animals must pass a vets health inspection before being shipped out… even animals being picked up on location will have a health certificate for this reason. HELP MOTIVATE FELLOW EXOTIC PET OWNERS TO GET INVOLVED IN KEEPING OUT HOBBY LEGAL! 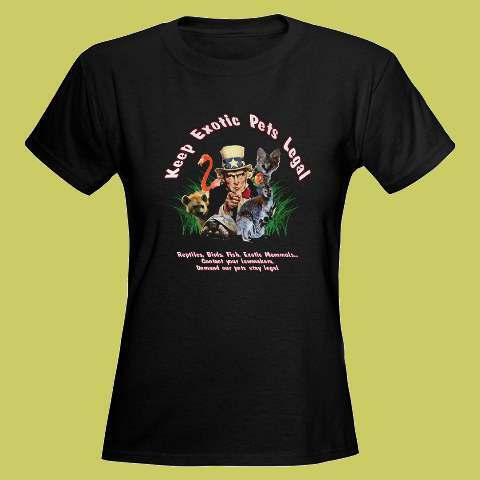 BUY THE "KEEP EXOTIC PETS LEGAL" SHIRT TODAY! Note to the media. This website is not to be linked to and/or featured on any type of media in any way shape or form without the written (and paid) permision of the owner, Ken Walker. This site is now just a resource. I offer care sheets. It is add supported, without the support from these ads, the caresheets would not be here. .